to buy a silo in which to keep the corn she grows. Bernardina benötigt für dieses Geschäft noch 450 US-Dollar. » Schon mit 25 US-Dollar können Sie Bernardina unterstützen! Geld wird für Bernardina gesammelt. Bernardina is 68 years old and did not have the opportunity to study. Her husband died during a war in the county, and she has 4 children who are independent. 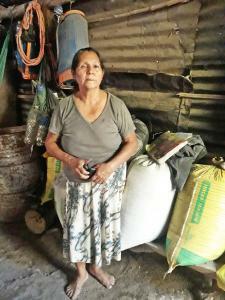 She is dedicated to house work, but has also worked in agriculture since her husband died. Her land is near her house, and she works from 6:00am until noon. She will use the loan to buy a silo in which to keep the corn she grows. She dreams of continuing to work and of leaving a good inheritance for her children.